I was at this show and it was great! I sat in the 14th row up front. I took pictures also. I loved Endless Dream! Perfect weather that evening! Jon was magical! Rabin is a great guitarist! I did miss Howe of course. The view of this place is one of a kind! I saw Page/Plant after in 98. That was a real experience also! What an amazing show! Fantastic trip down to hear the best of the best! 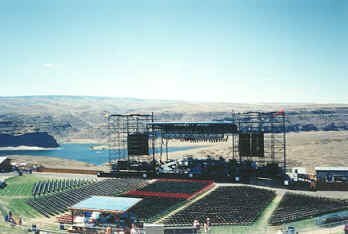 Incredible outdoor acoustics, with the Columbia river in the background....sun going down...It was a HOT day. I remember Jon messed up the words to "Owner". Billy had his back turned to the crowd staring out at the landscape(best job in the world! )most of the time. 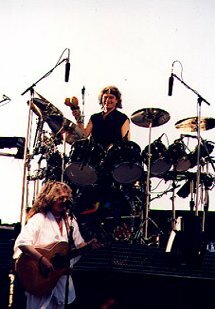 I had seen Yes just a few days before at the Gorge in Washington, which was a total outdoor venue (the stage was practically on the edge of a cliff), and as daylight prevailed the crew set up only a portion of the lighting. It's incredible to be with you this evening. Looking for the rhythm. 'The Rhythm Of Love'. You look amazing. You really do. Woo! Many moons cascade one river. They light from side to side. As we cross in close proximity. Like rivers our hearts entwine. Thank you. Everybody. Here's a song from the new album 'Talk'. Earth music. Sky music. The wind. 'Real Love'. 'Real Love'. All this and a sunset. What a life. Okay. On the keyboards, the incomparable Mr. Tony Kaye. Introducing this next song, to be sung by, a great guy, great producer, incredible musician, Mr. Trevor Rabin. Thank you. You look wonderful. Woo! We're going to do the song and have a break. You guys just put more suntan lotion on. Have a beer, suntan lotion. Here's a song that..uh me and Chris put together many many zillion years ago on the planet Zongo. [???]. 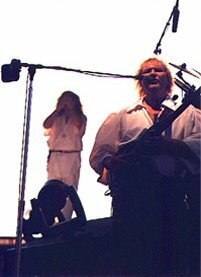 Introducing Mr. Chris Squire. Woo! Thank you. Thank you. You look amazing. Just amazing. Thank you so much. Thank you. Last year, last year we put together a new album. It's called 'Talk' and..uh one afternoon I went up to Trevor's place. He was recording the album at his house, the music and he was playing a piece of music and I just naturally wanted to sing a song so I wrote down the lyrics and..uh to this day I still can't remember them so I have them written here. Very simple, very simple lyrics but a couple of months later I went over to listen again to the song and realized I was singing about something way way deep in my consciousness. The idea of living another life. Living many lives. Having been here many times on this planet. I realized one thing it seems we've been here before. Maybe we all were here one time as American Native Indian or we all were African or we were all Chinese. Maybe we've lived so many lives, we can never remember. But into the twenty-first century, we shall remember. Song is called 'Where Will You Be'. [???] Many reasons why I want to sing the next song is [???] 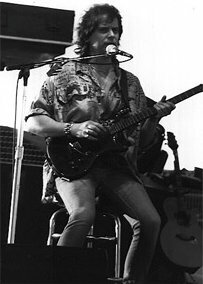 I always wanted to hear on the Maracas, Mr. Alan White from Seattle. Woo! Yeah. Another reason, [???]. One other reason I want to say, lets here for it our new friend on stage. He's playing all sorta of things, acoustic guitar, electric guitar, keyboards, tap-dancing, combing his hair. Looking after himself. In the spotlight, behind the sun. Mr. Billy Sherwood. [???]. Another great reason to sing the song. Please sing along, sing along. For my love. Thank you. Wonderful. Sun is going down. Many great reasons to be in Yes. We spend a lot of time in the studio writing songs. The best thing is coming out on the road and playing to you wonderful, wonderful, wonderful. It really makes it all worth energy. Another great reason to be in Yes is be able to perform songs like this next one which is really what Yes music is all about. This is a song called 'Endless Dream' from the new album.